Solve It! Bamboo can grow very quickly. The graph models the growth of a bamboo plant. Find the point where the line crosses the vertical axis. What does this point tell you about the bamboo plant? Solve It! Find the slope of the line. 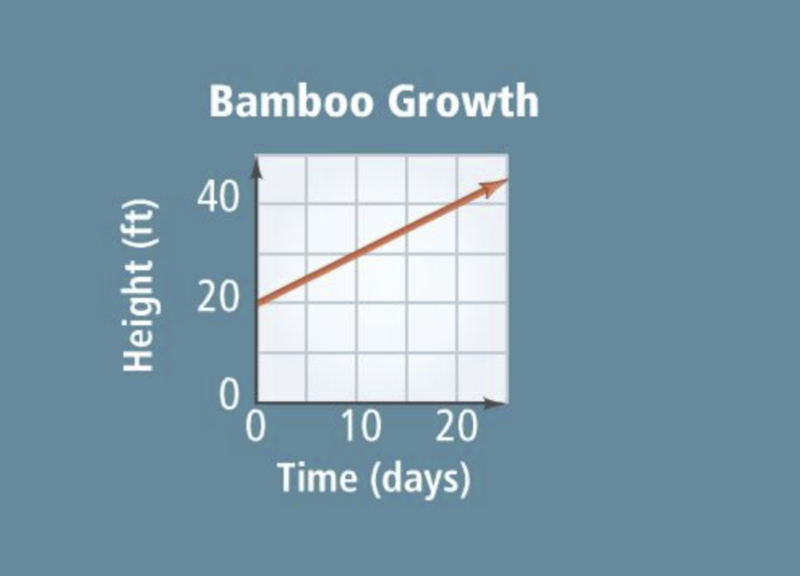 What does the slope tell you about the bamboo plant? Problem 1 Got It? What are the slope and y -intercept of the graph of the equation? Problem 1 Got It? 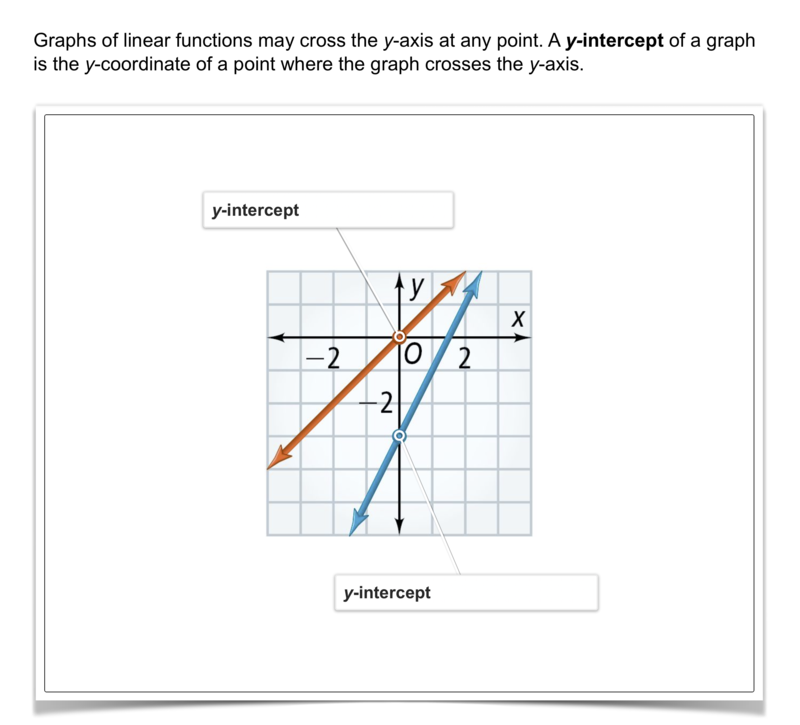 Reasoning: How do the graph of the line and the equation of the line in the previous item change if the y-intercept is moved down 3 units? Problem 3 Got It? What do you expect the slope of the line to be from looking at the graph? Problem 3 Got It? 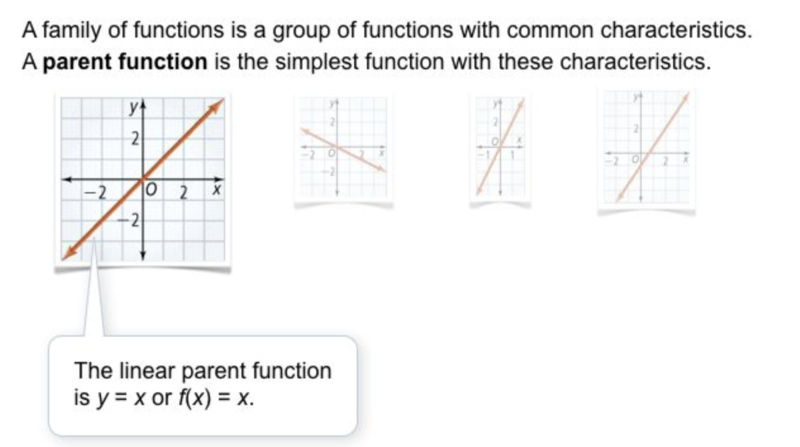 What is an equation of the line shown in the graph? Problem 3 Got It? Reasoning: Does the equation of the line depend on the points you use to find the slope? Problem 5 Got It? Graph the linear equation. Problem 6 Got It? A plumber charges a $65 fee for a repair plus $35 per hour. Write an equation to model the total cost y of a repair that takes x hours. Problem 6 Got It? A plumber charges a $65 fee for a repair plus $35 per hour. Construct a graph to model the total cost. 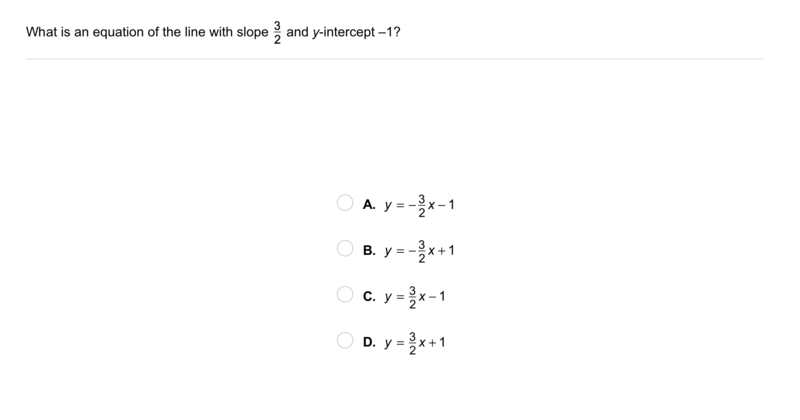 What is an equation of the line with slope 6 and y-intercept -4? 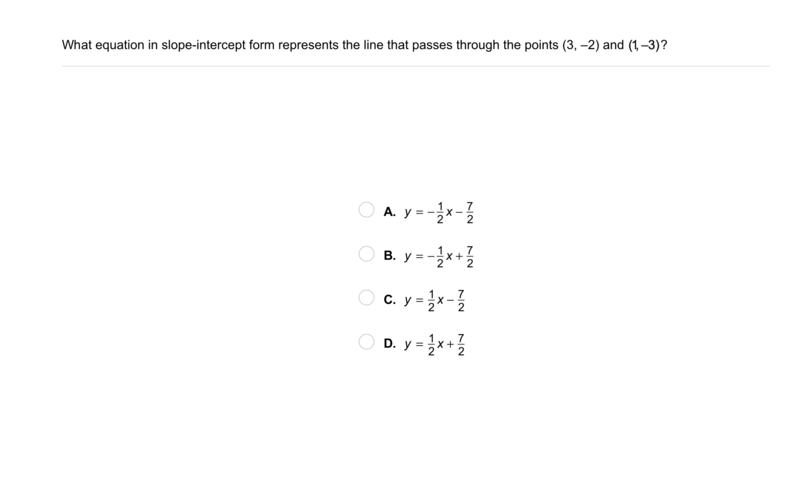 What equation in slope-intercept form represents the line that passes through the points (-3, 4) and (2, -1)? What is the graph of y = 5x + 2? Vocabulary: Is y = 5 a linear equation? Explain. Reasoning: Is it always, sometimes, or never true that an equation in slope-intercept form represents a direct variation? Reasoning: Explain your response above. Writing: Describe two different methods you can use to graph the equation y = 2x + 4. Which method do you prefer? Explain. Review Lesson 5-2: Suppose y varies directly with x. Match the given values of x and y with the direct variation equations. Review Lesson 2-2: Solve the equation on the canvas. Justify each step. Review Lesson 1-7: Simplify the expression. Vocabulary Review: Which equation is NOT a linear equation? Vocabulary Review: Classify each statement as true or false. The graph of a linear equation is always a horizontal line. The graph of a linear equation is always a straight line. The graph of a linear equation may be shaped like a "U." During a football game, the home team's quarterback threw an __?__. 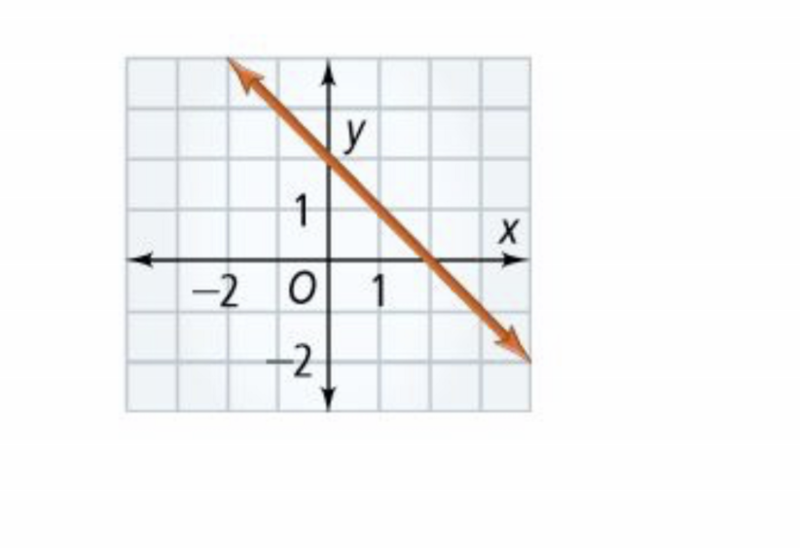 The y-coordinate of a point where a graph crosses the y-axis is a y-__?__. The teacher __?__ the message Charlie was passing to his friend.